It wasn't until Pete and I actually visited France during our honeymoon that we both truly fell in love with French cuisine. Spoilt for choice we wined and dined our way around France, amazed by the quality and value of many a fixed price menu. 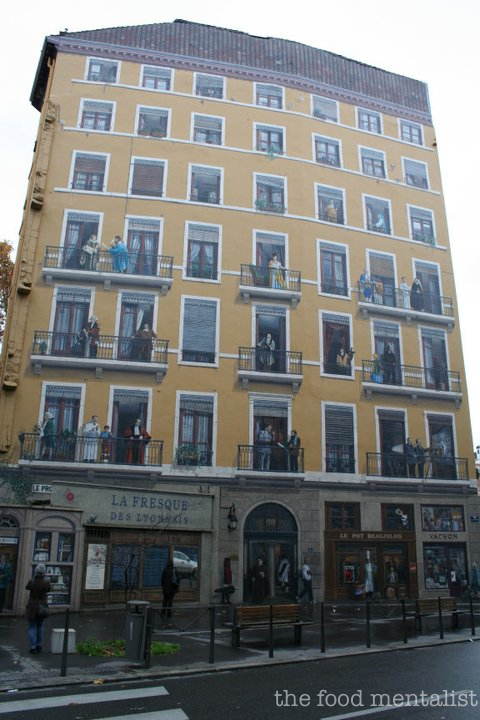 Whilst visiting Lyon - we secured a booking at Paul Bocuse's brasserie Le Sud and set out to find it. After getting distracted by a local market we ended up lost in the cobbled backstreets of Lyon surrounded by some of the city's impressive painted walls. After asking for directions (to no avail), we became quite frustrated and had all but given up when we stumbled upon the brasserie. 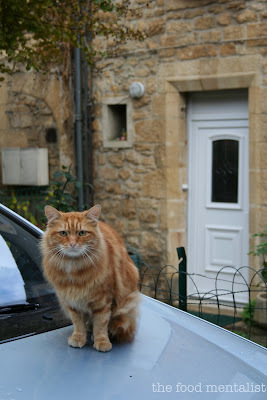 Absolutely starving and late for our reservation, the staff informed us they could not find our booking. We insisted we had made one through our hosts at our accommodation and whilst they buzzed around trying to find our reservation and turning others away because they were fully booked, we stood waiting for a table to become available. It wasn't until we were seated that we realised we were actually sitting in Le Nord - another of Paul Bocuse's brasseries. Whoops! Decorated with wooden benches and panel walls, Le Nord represents a classic French brasserie. The food was also very traditional and I chose the French Onion Soup and the Beef Bourguignon - two dishes I had been eager to try during our trip. Both were divine and everything I had hoped for and of course when I spotted the oozy chocolate fondant on the menu I just had to finish with that too. We actually rolled out of there after lunch and hired bikes later in the afternoon, touring around Lyon. It was wonderful! 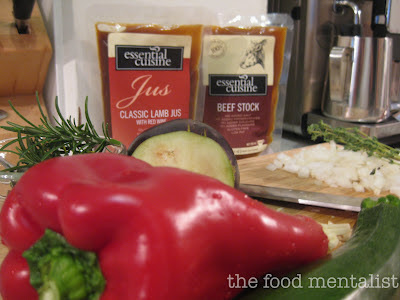 I was recently introduced to a new range of premium cooking stocks and jus and decided that they would make the perfect addition to a French themed meal that Pete and I had been planning for some time. Essential Cuisine have just launched in Australia and consists of 4 stocks ( chicken, lamb, beef and vegetable) and 2 jus ( lamb & beef). 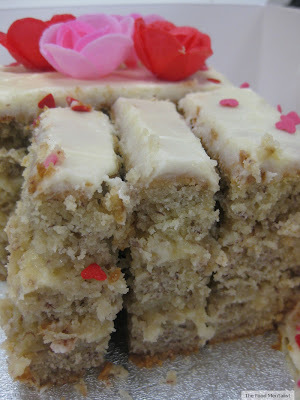 They are made the traditional way and are packed full of quality ingredients. I love the fact that they are packaged in convenient pouches and I don't have to spend hours making a stock or jus from scratch - they really do taste great and added a delicious flavour to the dishes we prepared. Not having the luxury of a bike to ride around on after a big meal, we decided to make a 2 course feast - entree & main. French Onion Soup for Entree & Grilled Loin of Lamb w/ Ratatouille & Tapenade for our Main Course. 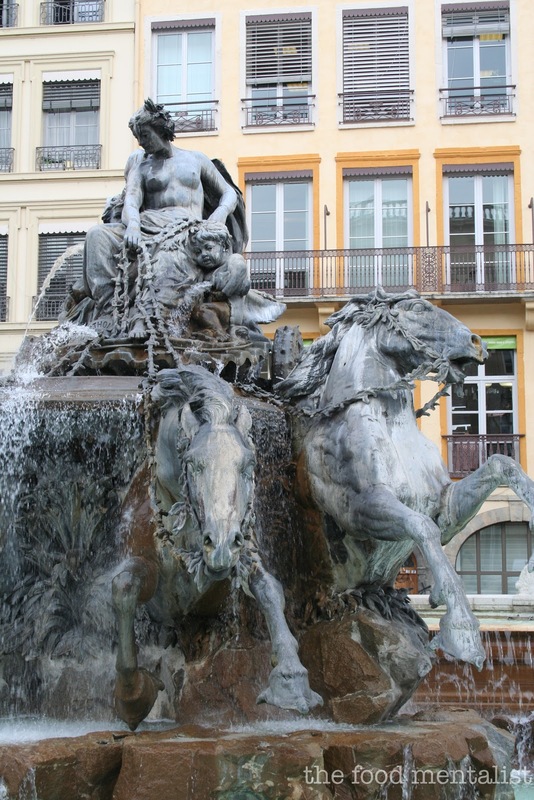 As we ate our home made French Onion soup we were instantly transported back to our adventure that day in Lyon. The lamb dish was Pete's choice and we have already cooked it a second time. Slice onion into thin rings and fry with butter over medium heat until onion begins to soften. Reduce heat to low and add bay leaf, thyme,salt and brown sugar and continue to cook slowly. Cook for approximately 40 minutes over a very low heat until onion mixture has caramelised and has cooked completely. Deglaze the onions with the white wine and stir in the beef stock and 750ml of boiling water. Allow to cook for another 35 minutes. Whilst the soup is cooking add the extra butter to a fry pan and fry the pieces of baguette until golden brown on each side. Remove and set aside. Once the soup is ready, season to taste with salt and pepper and transfer into 2 large oven proof bowls. 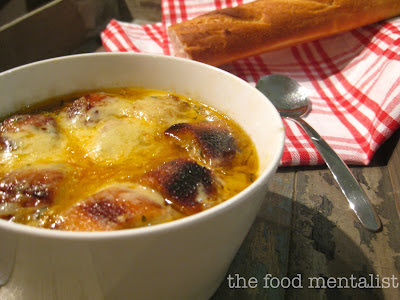 Top each bowl of soup with 4 rounds of baguette and half of the grated Gruyere. Place the bowls under the grill until the cheese melts and starts to bubble up. Season the lamb loins with olive oil, garlic, pepper and rosemary and marinate in the refrigerator for at least 30 minute. To make the Ratatouille - heat the oil in a saucepan over medium heat. 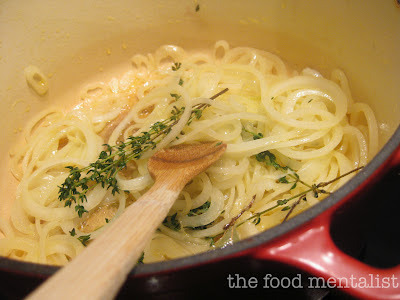 Add the onion and thyme and fry for a few minutes. Next, stir in the garlic, capsicum and stir for a few minutes. 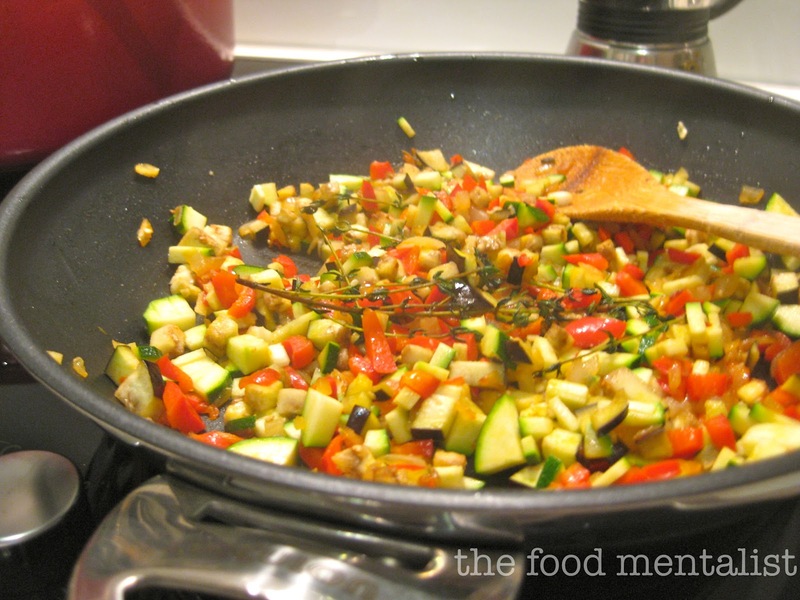 Then add the eggplant, zucchini and tomatoes and bring to a simmer and cook over a low heat for approximately 30 minutes or until the vegetables are soft and cooked through. Refrigerate until required. To make the tapenade - blend all the ingredients to a paste and store in the refrigerator until 15 minutes before serving. Grill the lamb for 3-4 minutes on each side. Turn off the heat and cover the meat and leave it for at least 5 minutes to rest before slicing. Serve the lamb loins with hot ratatouille. Season with salt and top each loin with a tablespoon of tapenade and sprinkle with parsley. 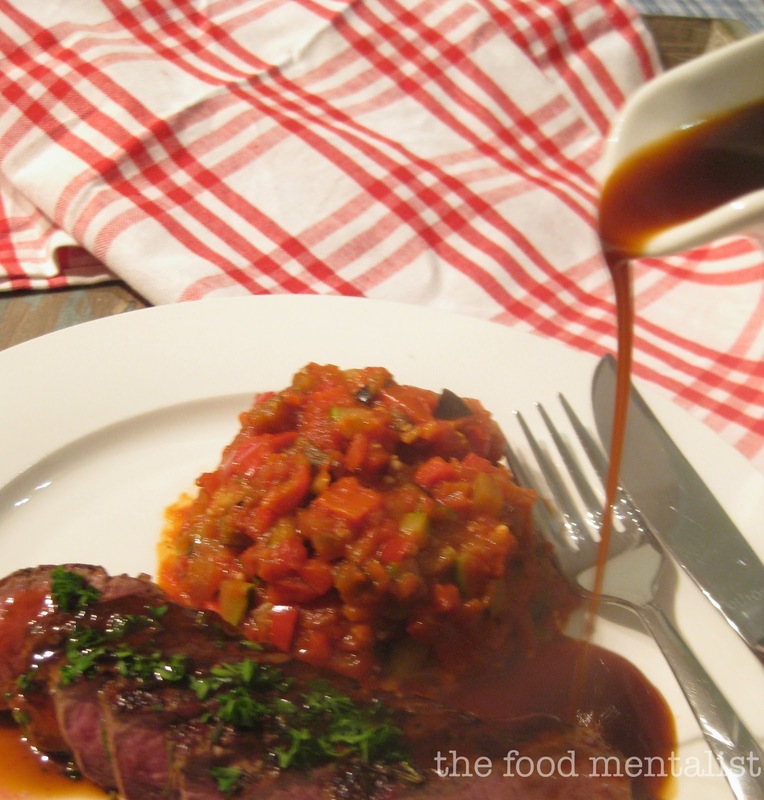 Drizzle with warmed Essential Cuisine Lamb Jus. Even the cats in France look chic! Tell me, have you ever been lost looking for a restaurant? The Food Mentalist sampled Essential Cuisine Stocks & Jus compliments of Essential Cuisine. Now there's a coincidence - two meals i've eaten this week are French onion soup and Beef Bourguignon. 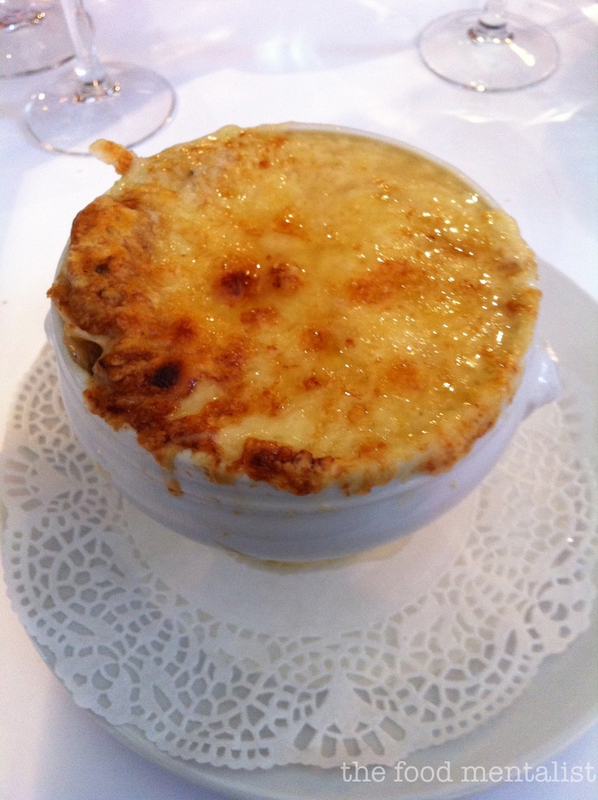 French onion soup was one of the dishes we ate at La Brasserie in Darlinghurst last weekend - have you been? Great French style brasserie. And Beef Bourguignon i made from Maeve O'Mara and Guillaume Brahimi's new book French Food Safari - a marvellous rendition of dish and an excellent book if you are looking to continue your French cuisine adventures. Lovely post. Thanks for sharing. I love seeing what others have made with their little mystery boxes! Your soup looks really special. And home made tapenade?! AWWW YEAH!